Caesar has conquest on his mind, and he is asking you, his faithful minion, to mobilize your legions and conquer. They’re a little strange, Caesar’s ways, but we don’t question them. We don’t dare question them, especially when a lucrative consul position is on the line. 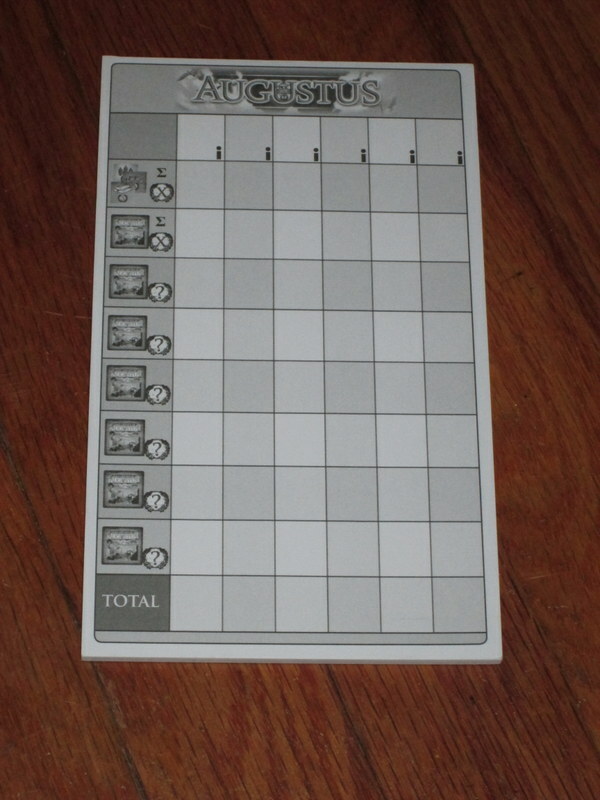 Rise of Augustus is a chit-pulling/resource management game for two to six players. 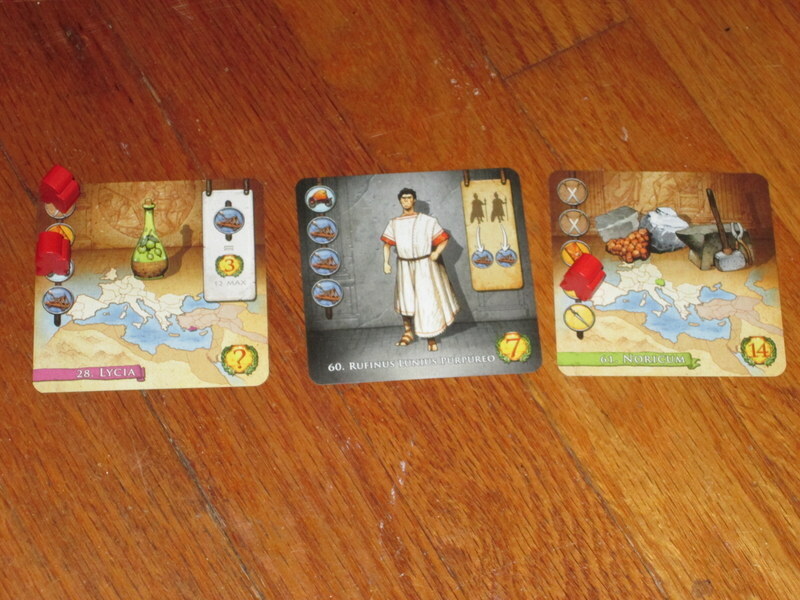 Players vie to complete objectives and earn victory points in order to secure the position of Caesar’s consul. The player with the most victory points wins. 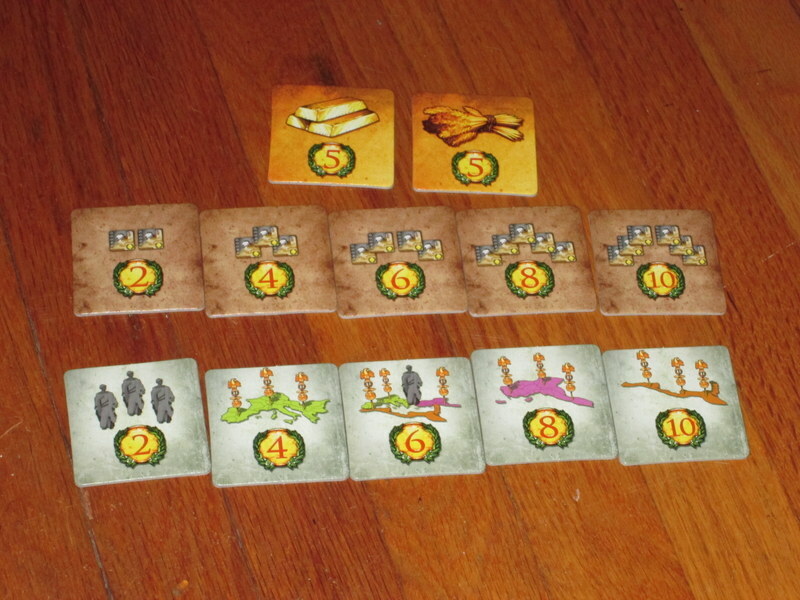 At the start of the game, each player receives six objective cards and chooses three to keep in front of them. Each player also receives seven legion tokens. The reward tiles are placed in the center of the table, and a row of five objective cards is placed in the center as well, next to the draw deck. One player is chosen as the town crier and receives the bag of mobilization tokens. The mobilization tokens. Not quite as classy as a bingo cage, but not bad. When players complete objectives, they first take their legions back into their personal stock. They then activate the objective’s ability (if it has one) and may claim any reward tiles they’re entitled to. Reward tiles offer bonuses for collecting sets of objective cards, for having the most province objectives with gold or wheat resources, or for completing a certain number of objectives (only one of these latter objectives may be claimed per game, and only upon completing the objective that gets you to that number, so there’s an element of press-your-luck here). Once rewards are claimed, the player chooses a new objective from the line-up in the center of the table, replacing it with a new objective from the deck. The town crier continues to call mobilization tokens until a wild token is drawn. At that point, all tokens go back in the bag, and the next player becomes the town crier. The game continues until the end of the turn when one player has completed seven objectives. The game ends, and the player with the most points is the winner. Pax Romana, or Bingo Was His Name-O? Rise of Augustus generated some buzz last year when it was nominated for the coveted Spiel des Jahres award (which was won, justifiably in my opinion, by Hanabi). Since Rise of Augustus has entered the spotlight, there have generally been two responses to it: it’s just Bingo or it’s oh so much more. As you will see from the rest of my review, I think the game falls somewhere in the middle–in just about every category. Rise of Augustus (henceforth “Augustus” to preserve keystrokes) is like Bingo, there’s no way around it. Those who say the game bears no resemblance to its parentage are kidding themselves. Even the box says the game “provides an interesting twist on an old family favorite.” And they’re not talking about Euchre or Yahtzee, so come on! See? No sense in denying this game’s relationship to Bingo (although it really is more than just Bingo). But Augustus really is more than Bingo. Bingo has an even distribution of tokens in the bingo cage: the caller is no more likely to pull a B from the cage than an I or an N (at least at the start), and no one number is more or less common than another. Players have unlimited markers in Bingo. Bingo is pure chance, more an activity than a game. 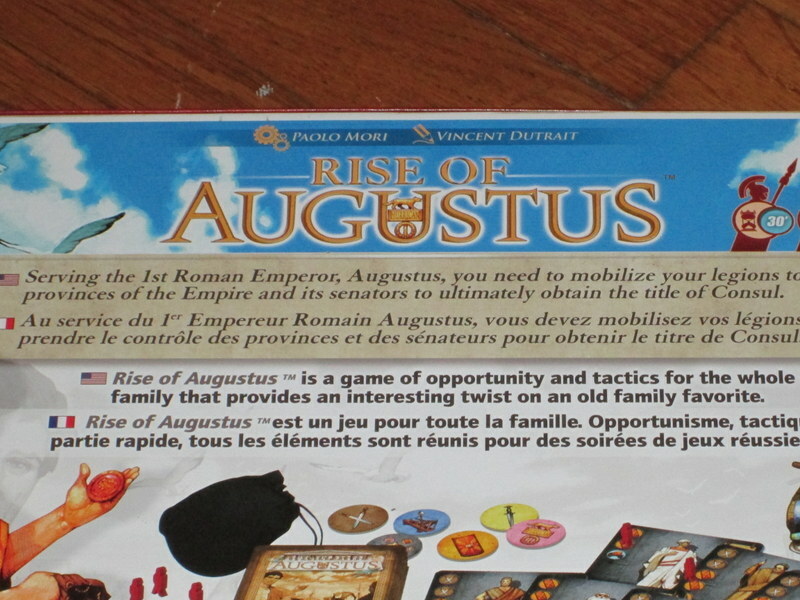 Augustus, by contrast, includes player aids that advertise the distribution of mobilization tokens in the bag, and the probability of drawing one versus another is different. With players having control over which objectives they draft as well as which prizes they aim for, there is definitely more to this game than what your grandma may be used to down at the community center. In a word, there is player agency. But I’m not sure the game is better for that. I have a confession: I kind of like Bingo. Yes, it’s an activity, not a game, but given the right environment, it’s kind of a fun activity. Will the chips fall your way? (If you’re me, probably not.) Will you win the prize you sought? (Usually some junk you didn’t need in the first place.) There are worse ways to pass the time than hoping your number will be called, cursing the caller who has always had it in for you, and speculating on whether just probability is at work. Augustus succeeds in making a game out of this activity, but in the process it loses the experience that makes the activity fun (or at least tolerable) in the first place. The different kinds of objective cards with their abilities. Some are senators, some are provinces. All are up for grabs. 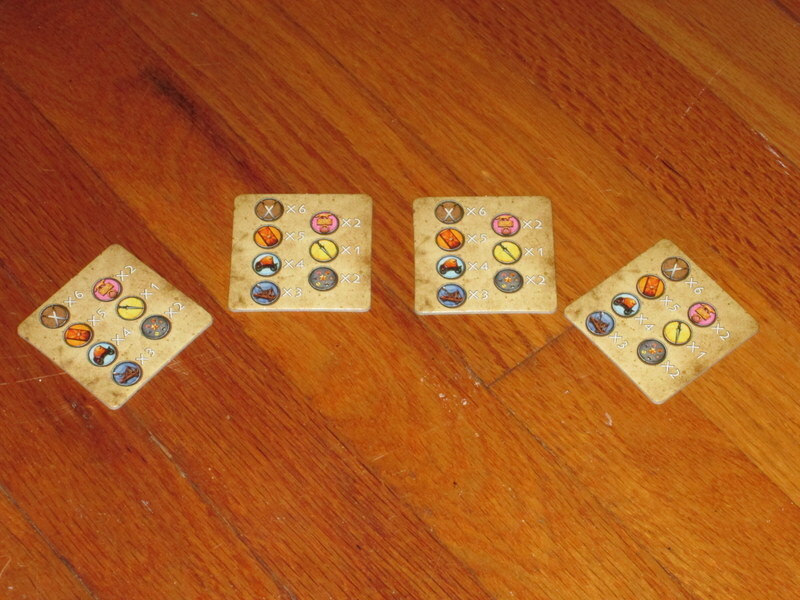 For example, Augustus accommodates two to six players, but the game feels different at each count. With more players the game slows down as players stop each time someone calls “Bing–” er… “Ave Caesar!” to perform their ability, claim rewards, and choose a new objective. This reenacts the worst part of Bingo. “Could you read off your numbers, please, so we can verify your win?” “Let me get my glasses out. Now, let’s see…” Ugh. Bingo works best as an experience when it moves quickly, and Augustus does too. Which is why, downtime-wise, the game flows best with two players. Yet with two, players lose the excitement that Bingo can provide–of collective ill will toward the current winner, of comaraderie in shared misfortune, of the joy of victory over your erstwhile comrades as your numbers were called. Sure, with two the game moves as smoothly as you want it to, but it’s also less interesting. Similarly, the reward tiles (and particularly the number-of-objectives reward tiles) are much less interesting with two. Once one player chooses to claim a reward tile, the tension is removed. The game probably works best with three or four players, which is strange, as the energy of Bingo is usually highest among a hall filled with people. Player aids help contestants remember the distribution of mobilization tokens in the bag. But there are only four, so you’ll have to share if you’re playing with a full six players. Augustus falls in the middle, too, in terms of complexity. The game is simple–do you remember when I said it was like Bingo?–yet it’s enough different from Bingo to be disorienting. There are three different kinds of rewards tiles, which behave in three different ways. Players must carefully manage their legion tokens, which are not an unlimited supply. Players must properly gauge the probability that they can complete the objectives they’ve chosen and not just choose the ones with the best abilities (a mistake I paid for dearly in one game), which is different from receiving a random bingo card. And there are lots of icons to parse in the special abilities. Admittedly, the iconography here is easy enough for those who are initiated into hobby gaming to understand–this isn’t Race for the Galaxy by any stretch. But the game feels simple, and the shallowness of the game doesn’t seem to repay the cost of learning it. That is, playing a game based on Bingo is a novelty, an interesting concept, but it seems more like an exercise than a game that will see sustained play. Those who are already initiated into gaming–gamers or otherwise–in my groups have found the game diverting, but not necessarily one they’re eager to try again. Those who aren’t initiated into gaming prejudge the game as too complex–“big box means big game, and wait, there are icons, and it takes place in Rome?” I think this initial impression is wrong, but getting new players to push past the initial impression is tough. You can do it (I “sell” games like Ticket to Ride, which generate this impression, all the time), but you have to be invested and determined, neither of which describes my relationship to Augustus. The components for Augustus also fall somewhere in the middle for me. They’re good quality, although the package seems a bit costly for what comes inside. The artwork is very nice, and the cardboard tokens are thick, but the components come nowhere near to filling their box. 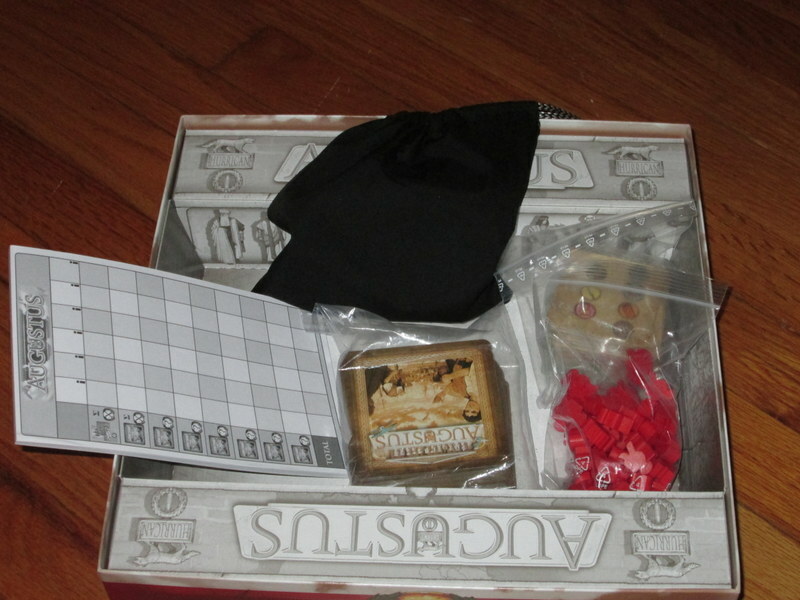 The box is a standard square board game size (think Ticket to Ride or Fantasy Flight’s lineup), yet the game’s entire contents (aside from the scorepad) can fit within the included drawstring bag. Speaking of the scorepad, one is included (presumably to add perceived value), but the game already has one of the most straightforward scoring systems possible, rendering it completely unnecessary. 7 Wonders or Agricola this is not. 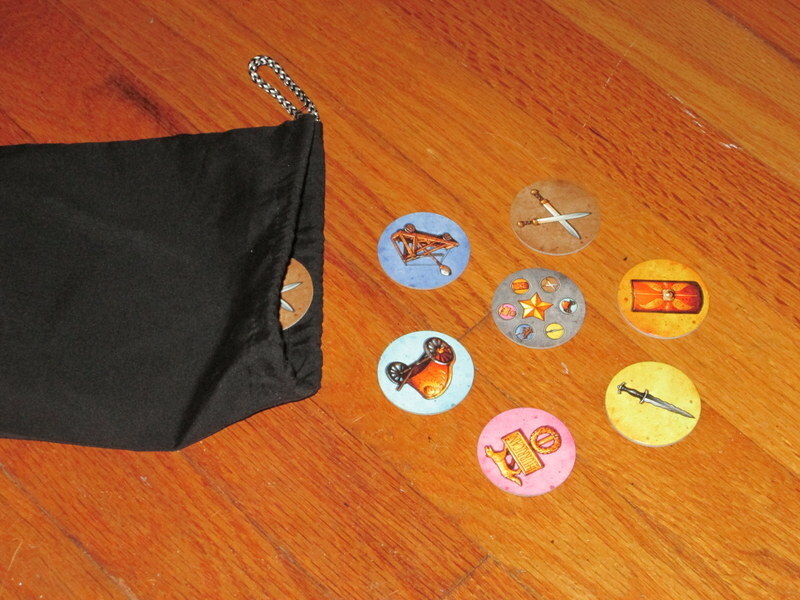 The game includes player aids that depict the distribution of mobilization tokens in the bag, yet there aren’t enough of these to go around (four are included for a six-player game). But perhaps the biggest disappointment in the components is the rulebook. The rulebook looks nice and seems to be laid out well, but the rules (perhaps because of their translation to English) leave ambiguity after ambiguity. The publisher has produced an FAQ, and the designer and publisher have been active in the Board Game Geek forums answering questions, but for a game as simple as this, it requires a decent amount of research to ensure the rules are being followed correctly. If you couldn’t tell from the rest of this review, I think Augustus is just okay. It’s obviously more than “just” Bingo, but the places it deviates from it don’t make for an interesting game to me. It’s not a poorly designed game, or unfun, it’s just…middling. Now, here’s where you can take my opinion with a grain of salt: I don’t understand the need for shelves and shelves of “gateway” games–the games simple enough for new players to grasp and show them that board games are not all about subduing your enemies or placing all their worldly goods into your own treasury. For me, a few favorites are enough. I’m willing for my circle to be widened beyond games like Ticket to Ride, Pandemic, Bohnanza, et al. (and my circle often is–Hanabi, Sushi Go!, and Coloretto are new discoveries), but unless a game of low complexity really wows me, it’s just not worth bringing out again and again. If I’m not excited about it, new players won’t be, and my friends who are already interested in games would probably prefer something more substantial. Augustus thus falls out of any category where I’d have use for it. I’m sure some players will love its twist on Bingo, and I can imagine groups that might get excited about it. I’d be willing to play it some more if someone else wanted to, but I’d much rather bring along something else if I have just twenty or thirty minutes. (Consider this list, for example.) For one thing, it would probably take up less space in my bag. 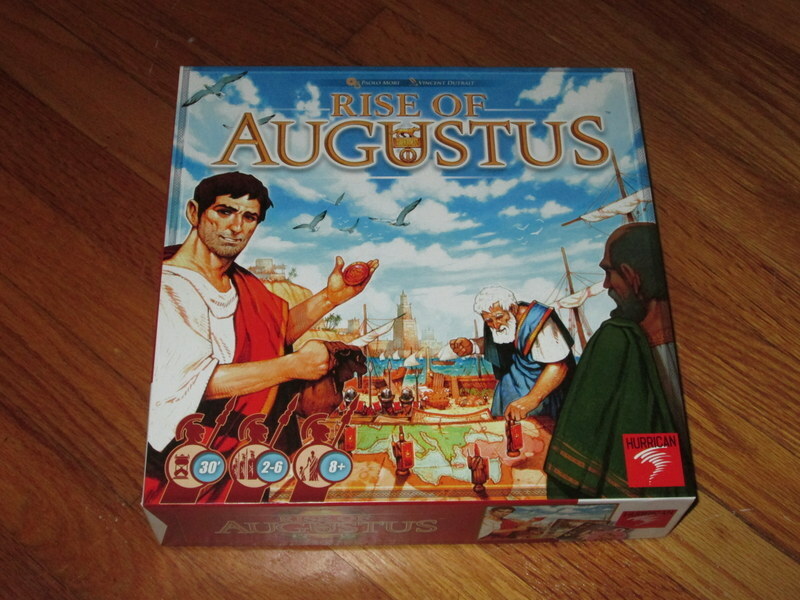 I keep hearing good things about this game, but I’m having a hard time getting past “Bingo.” Do you have any idea why the name was changed from just “Augustus” to “Rise of Augustus”? My guess on the name change is that it was to make the game more salable in the States. Usually one word titles that are proper nouns are the province of stodgy Euros, not mass market family crossovers. The “rise of” adds fun and excitement, don’t you think?